Iran’s sanction supporting the Crude Oil – Are you ready for buying trade? Crude oil prices fell in early Asian trading on concerns that the United States is ready to force additional tariffs on China, outweighing supply fears from upcoming sanctions on Iran. Refiners in India, Iran’s second-biggest crude buyer will cut their monthly crude fillings from Iran for September and October by almost half from earlier this year. Considering this, we have opened a buying position in crude oil. The WTI has a 50- periods EMA bullish crossover on the hourly timeframes. 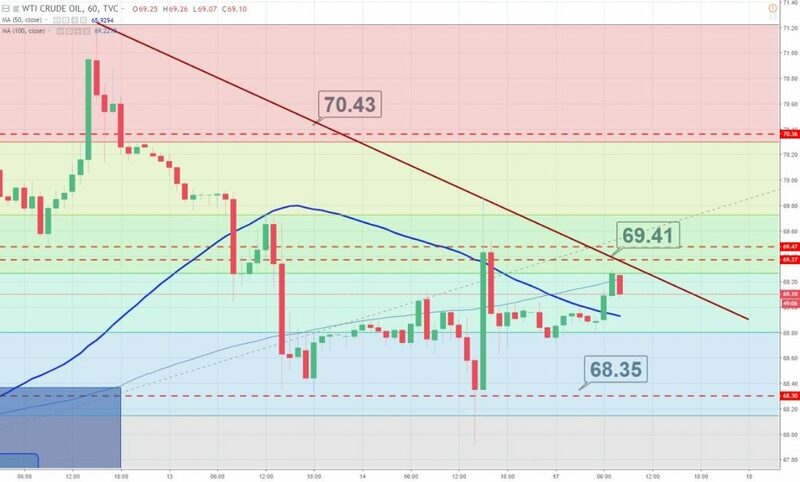 The crossover is representing the buying sentiment of investors, therefore, we shared a forex trading signal to buy at $69.09 to target $69.40. The market is bit slow today and this position can be risky due to the sideways behavior of the market.